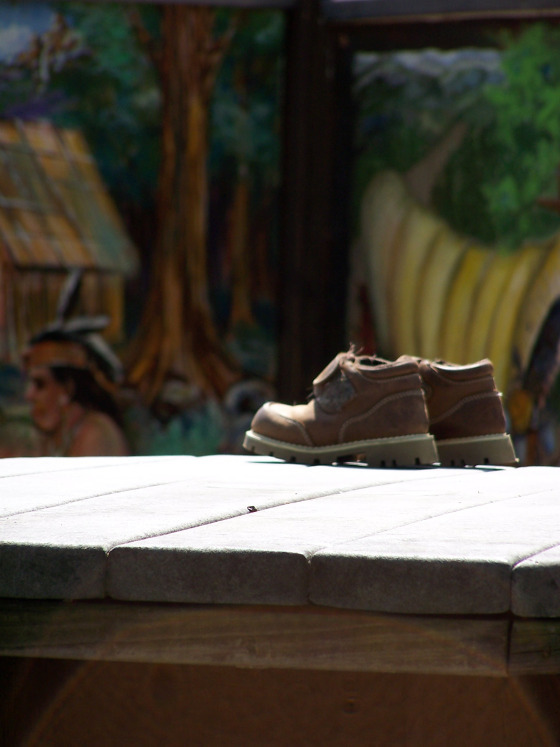 First impression on seeing this photo of the young child’s boots was “I’m outta here.” It may have been my mood at the moment, but that’s the way this week’s story is going to go, too. Outta here. You can’t fence me in. All your childproofing and safety latches don’t mean a thing to me. I am Houdini reborn, a rebel in pull-ups. I can crawl, I can climb, I’m aiming to run soon. I am your worst nightmare. Stay young a while longer, little one. The world can be a big, scary place. You don’t need to rush it. Let me protect you, love you, keep you. Don’t leave me just yet – stay close. What do you know, old woman? You’re afraid of your own shadow. I’m not afraid of nothin’. Give me my boots. I’m outta here. Haha. Great story from a child’s perspective. Well done. Really good voice here. I liked this one a lot. Great take on the prompt Erin. One day, I’ll probably be a rebel in Depends. Somebody is gonna have their hands full. And someday the unbridled child will be the old woman. In Hebrew we say L’dor v’dor. From generation to generation. Like Ron, I loved the way you did the two points of view. Hard to make it work in 100 words. You’ve succeeded. Oh the youth… and the old,… why can’t we have a little of both? An enjoyable interpretation of the stages of life. Erin, I especially enjoyed that first paragraph! Great story – I hadn’t sen those as child’s boots until now.